Posh striker Jack Marriott is tackled/fouled by Murray Wallace of Scunthorpe. Photo: Joe Dent/theposh.com. Peterborough United manager Grant McCann blamed individual errors and lapses in concentration for the latest poor League One result at Scunthorpe today (October 21). 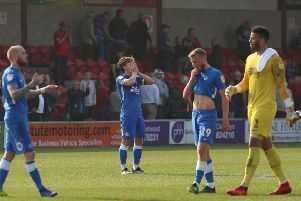 Posh went down to 2-1 after conceding two goals in the final 10 minutes, the second from a penalty after a disastrous backpass from Andrew Hughes. Hughes had earlier fired Posh in front with his first goal of the season. Posh teenager Leo Da Silva Lopes is consoled by manager Grant McCann after his substitution at Scunthorpe. Photo: Joe Dent/theposh.com. Posh have picked up just one point from their last five League One matches. They are now 10th in League One with a home game against unbeaten leaders Shrewsbury up next (October 28). “I am hurting for the fans,” McCann stated. “The players are hiurting and so am I, but it’s the supporters I feel for the most as they should have travelled home celebrating a win. “For the most part we were very good today, but individual errors and lapses in concentration have killed us. “We should have managed the game better from 1-0 up. Instead we conceded an equaliser after a player dived in and let an opponent go by him and we didn’t mark the striker in the penalty area. Posh striker Jack Marriott in action at Scunthorpe. Photo: Joe Dent/theposh.com. “And then we conceded a penalty out of nothing. (Goalkeeper) Jonathan Bond shouldn’t have tried to play out from the back and obviously Andrew Hughes then played a poor backpass. It’s about making the right decisions and players simply doing their jobs. “You never see our experienced players like Steven Taylor or Anthony Grant making a mistake. The others players need to learn from them. “And that goes for when we are attacking as well. We switched off after we scored and wasted some good attacking positions. Posh were irritated by a couple of refereeing decisions by Mark Heywood. Home midfielder Neal Bishop appeared to be given two final warnings in the second-half after collecting a first-half caution. And Jack Marriott appeared to be fouled in the penalty area in added time, but Heywood waved Posh appeals away. “100 per cent Bishop should have been sent off for the foul on Anthony Grant,” McCann added. “He said he slipped, but I’ve played against Bishop and he knew what he was doing. He’s clever. “I haven’t seen the Marriott incident back, but it looked like the player went through Marriott to get the battle. If it wasn’t a penalty it was a corner and yet he gave a goal kick which rather sums things up for us right now. Centre-back Ryan Tafazolli missed today’s game because of injury, but should be back in training early next week. Midfielder Chris Forrester was given time off to visit his young daughter in Ireland.